LATEST! We are receiving a lot of responses from piano players, as this is a Pop Band/Ensemble Workshop, applicants who play other instruments other than piano (eg. guitar, drums, bass guitar) will have highest priority so that the objectives of this workshop of playing in a band can be achieved. Who is suitable to attend this workshop? Music enthusiasts, music lovers, musicians who have always wanted to break out of their dependence on music scores and are looking at playing more with chords, improvising and also a desire to play with like minded musicians in a Pop Band. What kind of music will be used in this workshop? for this specific workshop, it will largely be Pop Music. How do I know whether I am suitable for this workshop? 2. I have taken at least a grade 3-4 in music qualification (Practical or theory) in the past. 3. I don’t have a grade 3-4 music qualification, but I can play pop songs using simple chord progressions and have a basic knowledge of scales, time and key signatures. 4. I can read and play basic chords like Am, G7, C.
5. I can read music notes, understand time and key signatures. 6. I would love to play in a band/ensemble and interact with others to make music. Is this workshop suitable if I am a beginner to music? I am a seasoned musician with experience playing in a band before. Am I suitable? This workshop is tailored for those who are dependent on music scores to play but have not fully entered the realm of music improvisation like playing with chords, playing in a band, being creative in their solos, drum fills, etc. 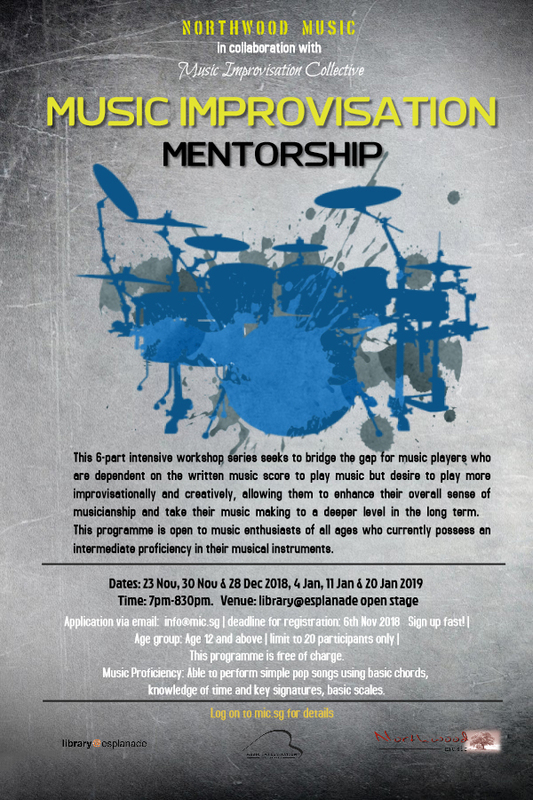 If you are a seasoned and experienced musician who already can improvise, this particular workshop is not suitable for you. What kind of instruments are you looking at? Since this is a Pop Band workshop, a good spread of instrumentalists is needed. So if you play the drums, keyboard, guitar, bass guitar, violin, clarinet, trumpet, saxophone, etc. you are most welcomed to join in. As the closing date draws nearer, we are particularly looking out for drummers and guitarists and bassists. Is this workshop opened to vocalists? Yes. As we have mentioned above, since this is a Pop Band workshop, there needs to be a good spread of instruments so that a small band/pop ensemble can be formed with different people playing different band roles. Is this workshop series free? Yes. It is opened to the community at large to benefit from an enriched Arts education. Can I just attend a few of the sessions in the workshop? No. The commitment is for ALL 6 sessions in the workshop in order for the band/ensemble to form, learn, train and perform one to two songs at the end. What is generally expected in this workshop? There will be basic chord training and application, improvisational concepts, how to form and play in a band, how to integrate with each other in a band, etc. leading to a final performance of 1 to 2 songs at the 6th and final session. Is there a certificate at the end of the 6 sessions? A Certificate of Excellence will be awarded to all who have attended all 6 sessions fully. Where is this workshop held? If you are a solo instrumentalist, you are required to bring your own instrument (guitar, bass guitar, violin, flute, etc.) for the workshop. Drums and piano are provided at the venue itself. Your guitar should preferably have some sort of built-in mic amplification – this will help you hear more clearly in a band context. Priority for successful registration is given to those who can attend all 6 sessions and for now, only those who play drums, guitars and bass guitars. The 6 dates shown here are the only dates for this particular workshop series. There are no alternative dates. This workshop is limited to 20 participants. If in the event that you are not chosen, you can STILL attend the sessions as audience/observers. As this is a Pop Band/Ensemble workshop, we need a good spread of instruments in order to achieve the objectives of playing in a Pop Band. For now, those who play drums, guitars and bass guitars only need to apply due to an imbalance in the applications so far. Sign up immediately below. The deadline to sign up is 6th Nov 2018. Once again, the workshop dates are: 23 Nov (Fri), 30Nov (Fri), 28 Dec (Fri) (2018), 4(Fri), 11(Fri) and 20 Jan (Sun) (2019). 7pm-830pm at library@esplanade. This workshop is limited to 20 participants. If in the event that you are not chosen, you can STILL attend the sessions as audience/observers. When will I know the outcome? : We will email you after Nov 6th when the application closes. Terms and Conditions(required) I understand that this is a workshop that has 6 separate sessions of 1.5 hours each and priority is given to those who can attend all 6 sessions in total. I am able to commit to attend all 6 sessions in order to achieve the full objectives of this programme. This workshop is designed for early intermediate to intermediate music enthusiasts with some knowledge of music. In case I'm not chosen I can STILL attend the workshops as part of the general audience.